Big Last Minute Savings! 4/20-4/27, 30% off! Hi Season at Lo Season prices! Mother Nature did her worst, but Andante and St. John are back and better than before! We are so grateful for all the support given us by our former and future guests and friends, during Andante’s restoration. You will love the improvements we have made. 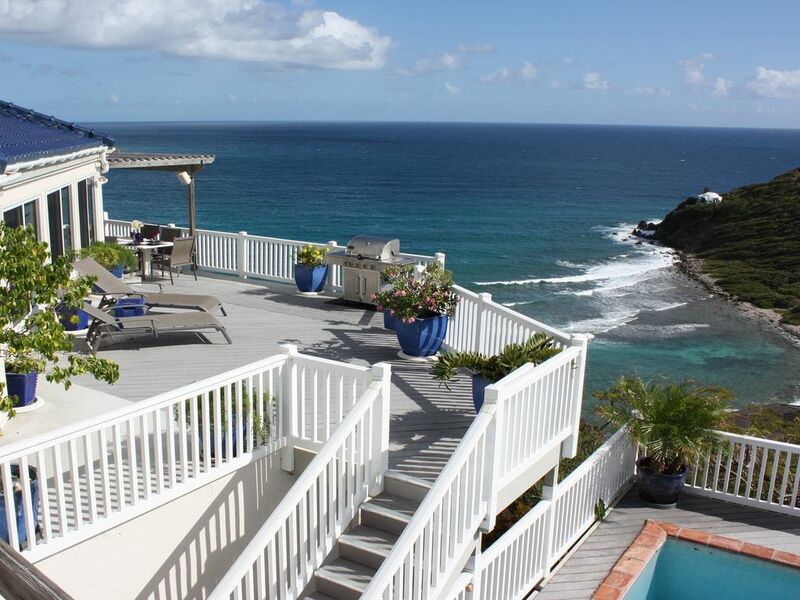 Come back to St. John , make Andante your home and fall in love again! Just minutes from the small town of Cruz Bay, with its restaurants and shopping, ideally situated on St. John's scenic southeastern shore and deliberately faced into the cooling trade winds...Andante is nestled on a shelf carved into the living rock directly above beautiful Hart Bay... high enough to look down on birds in flight... low enough to hear the sea. Architected in modified Mediterranean-style with accents of native stone, Andante is unusual in that, while ensuring privacy, its panoramic decks offer spectacular views of both sunrise and sunset... a full 270-degrees from glittering St. Thomas east to Rams head! There are three large bedrooms, all with sea views,private decks, full baths, and air conditioning. A king-size bed and rattan furnishings with a Victorian flair grace the master bedroom along with a private deck. The two guest bedrooms have twin beds easily converted to comfortable kings and private decks. The villa is tastefully furnished throughout in contemporary tropical rattan,teak and eclectic accents from around the world. Vaulted cypress-beamed ceilings, natural Scabos travertine floor tiles and overhead fans accent the great room, kitchen, and two upper bedrooms. The fully-equipped gourmet kitchen includes up to date appliances, an electric ceramic top range/convection & conventional oven, microwave, dishwasher, side-by-side refrigerator/freezer with ice maker/dispenser, whole house triple filtered and UV water systems, 'steaming hot' water dispenser, blender, coffee maker, bread maker, and espresso/cappuccino machine. A fully-automatic stainless steel gas grill and outdoor dining area for dinner under the stars is a few steps away on a trellised patio. The pergolas on the brand new pool deck and dining deck have been completely redone, affording even more filtering of the sun. The pool and hot tub are surrounded by an expansive new coral tiled deck, cantilevered into the cliff on the west side of the property for maximum views and breeze. Arise in the early morning, frolic in either, and appreciate the dramatic colors of sunrise. In the evening, sip champagne as the sounds of mellow jazz surround you and marvel at the complexity and beauty of the sunset and the clarity of the stars, while you are simultaneously warmed in the hot tub and cooled in the breezes of the ocean. Andante comes equipped with everything you will need for a relaxed island vacation. Linens, towels, phone, fax and printer, wi fi, hi speed internet, Satellite TV with premium channels and satellite radio in the great room and in each bedroom, DVD players, surround sound multi-zoned stereo (even piped to the pool and hot tub), CD-radio, beach chairs and coolers, and an extensive selection of books and music all await you. You need bring only your bathing suit and a few clothes for forays into town. A private rustic path winds down to the sparsely-peopled, pebble and coral beach below, offering fabulous snorkeling at one the best spots on the island. A left turn at the bottom of the hill takes you for a tranquil swim in nearby Chocolate Hole. The famous north shore beaches are but a few minutes’ drive away for long relaxing days spent at the beach. If 'chilling' is what you seek in your ultimate vacation, Andante is so self-contained that it is possible to 'hole up' in the villa for several days at a time, without the need to leave home. Andante is perfect for that first or second honeymoon. If you do venture out, the world-renowned beaches of the north shore and the boutiques and restaurants (ranging from funky to gourmet) of the tiny town of Cruz Bay are less than a ten-minute drive away. A fifteen-minute, seven-dollar ferry ride brings you to the bustling shopping and restaurants of St. Thomas. The word 'Andante' defines a moderately slow, relaxed, and leisurely tempo in music. At Andante, our guests have every opportunity to slow down, rest, relax, rejuvenate, and renew. When we first saw the villa that is now Andante, we knew this was the one! The incredible views, the never-ending breezes, the privacy, the proximity to and the sound of the ocean were just what we were looking for, and we knew that our guests would appreciate these as well. Andante has changed so much since we purchased it, but those core things have not and were the most important. Our guests think so too. The most important pastime for us when we stay at Andante is to honeymoon over and over again. It's the time we set aside to spend with each other and relax. We really did choose the name because it means 'to slow down'. We do. We both catch up on reading, talking, meditating; Rich paints; I experiment in the kitchen. Sure, we have to do work - but we also take time to unwind. Whether our guests are a couple on their honeymoon, a young or extended family or a group of friends getting together yearly, we want their time together at Andante to be loving and memorable. It's important to us that if our guests want to do nothing but hole up in the villa for days at a time, that they have everything they need to be comfortable doing just that. If they want to get out and explore the vast wonders of nature that St. John has to offer they are able to come back to a spacious and relaxing 'home base.' Our guests come from high pressure lives and we want to give them every opportunity to relax and rejuvenate in total comfort and serenity. Andante is located 180 ft above Hart Bay. A private, rough hewn path takes you down to the shell and coral beach side and some of the best snorkeling on the island. Post Hurricane Update: Our landline should be restored during spring 2018. In the meantime, cell phone service with AT&T is strong. For those of our guests without ve AT&T, we have a "go phone" available. You will need to purchase an AT&T simcard for it to work. Air Conditioning in all three Bedrooms. There is no A/C in the greatroom, but because of abundant breezes cross-ventilating the great room and our magnificent high speed fans, non is ever needed. All Stainless steel appliances, Cherry cabinets, Granite countertops, stocked with all cooking and dining tools and utensils to please the Stay at Home Chef or the casual picknicker. Great Room Stereo sounds can be piped to the Dining Deck and the Pool Deck. We have an extensive collection of popular hardcover "beach reading"
In addition to the indoor dining room, we have an outdoor dining area under a new pergola, facing the ocean, with speakers. Your choice: dine under the stars, catch the sunset, to sounds of the sea, or surrounded by music. Additional decks abound throughout the house, from sunny to breezy and shady for that lazy afternoon nap, or curling up with that great book! My husband and I and college age daughter just returned from 10 unbelievable days on St John and Andante by The Sea. Andante is in absolute pristine condition after Irma/Maria. We were blown away by the views of Hart Bay /Rendevous Bay when we first entered Andante and walked out onto the deck. The house is perfectly sited to receive the glorious tradewinds from the east. My husband and I stayed in the "Master" bedroom but the villa actually has 3 true masters with king beds and ensuite baths. We only used the top floor bedrooms but I asked to preview the bottom floor bedroom for future visits and it is spacious and lovely. The bottom story of the house also gets the easterly tradewinds. My daughter and I had fabulous massages on the lower deck with the tradewinds blowing but shaded. There is also a wonderful hammock on the lower deck which is a great place to lounge and read and nap. The bedrooms all have AC but I never used the AC in the east bedroom. The breezes at night(and all day!) were wonderful and we were lulled to sleep by the sounds of the wind and the ocean waves from Hart Bay. The bedrooms are all very private, with super comfy beds,the two top ones being separated by the great room. The house is beautifully decorated and was immaculately clean upon our arrival. It is fully equipped with everything you will need!Great kitchen! We opened the windows and doors every morning in the great room and kitchen and let the tradewinds blow through. (great screens in all windows and doors though we never saw one mosquito) The high speed ceiling fans are also great and we were never hot in the main part of the house. The satellite tv worked great and we were able to watch World Cup Soccer games while getting ready to go to the beach. The upstairs deck is large and has views east to Ditleff point and west over Chocolate Hole. You really DO get sunrise and sunset views from this villa! We watched the sunset every night from the brand new beautiful large hot tub and expanded new pool deck and sunrise from master deck. The pool is a great size and has beautiful new blue tile edging. Perfect for afternoon swims after returning from the beach. Easy 5 minute drive from Cruz Bay. Loved every minute at Andante. Marilyn and Rich(owners) were wonderful to work with and have obviously put a lot of love into this very beautiful villa. Megan and Dan, property managers were fabulous and responsive to any question. Can't wait to return to Andante! PS: What a wonderful idea to have massages on the lower patio! We are definitely going to do that when we return later this summer! Beautiful views, fantastic king suites suited for couples, great amenities with pool, hot tub! We loved Andante. The views were amazing and we had everything we needed for 3 couples to stay comfortably for a week. The hot tub and pool were gorgeous and we really enjoyed having the grill for dinner 'at home' a couple of nights. Would highly recommend. For families or couples wishing to have privacy and comfort! Beautiful, expansive views of the south side of St John and over to St Thomas. The home was lovely with every amenity. Would refer this to a friend and stay, again. Our family (including our 3 year old granddaughter) stayed at this beautiful home for Christmas this year. At first I was a bit skeptical about leaving Home for the holidays, but, ANDANTE felt like home. Rich and Marilyn, the owners made sure we had everything we could ever need. They also checked in with us during the week. I was able to contact them at anytime, and was always received with friendliness and a prompt answer to our questions. The decks, upper and lower, have spectacular views from all angles. The saltwater pool is wonderful, there is a gate on the top deck that prevents young children from going down to the pool area, which was a fantastic safety issue for our piece of mind. In fact, I cannot say enough about this piece of heaven. We will most definitely be returning and we HIGHLY recommend this to anyone who wants to escape and yet can be in Cruz Bay in minutes. THANKYOU Rich and Marilyn for sharing your beautiful home! My husband and I along with our two college age daughters stayed at Andante in December 2016 and had a wonderful vacation. The house is great - plenty of room , well stocked and a wonderful ocean breeze. The owners (and property managers) were very helpful with our plans. We were met at the ferry by Dan with the rental car and he took us to the Villa and. Rich (the owner) called us during the vacation to make sure we had everything we needed. The location is beautiful and very convenient to both ends of St John. We spent hours beach combing at the bay and hours in the hot tub. I would highly recommend this Villa. Thank you Marilyn and Rich for such a fabulous stay at Andante! Having previously stayed at a St John resort and various condos, we decided to try out a villa. This house was wonderful! The amazing view, clean house, and proximity to Cruz Bay was most enjoyable and appreciated. This house worked very well for our family of four and we would absolutely return. We have no hesitation or reservation to recommend Andante by the Sea to others. We fully agree with all of the positive comments from previous reviews. Wonderful house with a beautiful view. Thank you Marilyn and Rich for sharing your outstanding retreat! Fishing (on Hart Bay) and Deep Sea fishing available. St. John is 2/3 National Park and cared for by the VI National Park Service. Hiking trails, exploration of ruins, lovely beaches - all cared for by the NPS, and more secluded off road ones - abound. Even after the devastation of the hurricanes in Sept 2017, thanks to the hard work and resilience of St. Johnians, Park service employees, and friends and island guests from around the world, St. John's lovely natural beauty has been restored and continues to improve day by day.